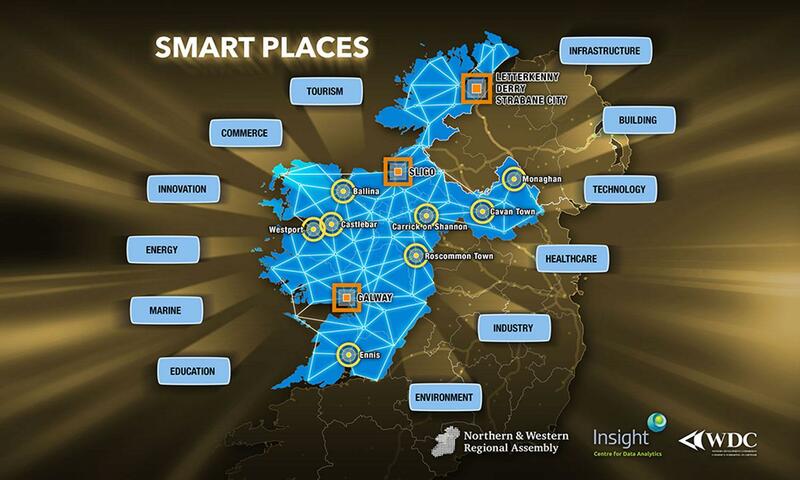 Smart Places aims to enhance the reputation of this region of Ireland as an attractive place to live, work, visit and do business. We aim to develop a world class public infrastructure and regional governance structure using technological solutions that will allow all stakeholders in the region to participate in decision making and enjoy an enhanced environment. This initiative will compliment and support the growing number of organisations in the region who are already working with smart solutions to improve our local communities, from localised renewable energy generation to so-called Internet of Things (IoT) sensors and open connected data portals. This project is a partnership between The Northern and Western Regional Assembly, The Western Development Commission and the Insight Centre for Data Analytics at NUI Galway. It will deliver a strategy to develop a world class smart region. It will focus on discovery and capacity building within the region. Ireland’s Northern and Western region was proud to be awarded the title of European Entrepreneurial Region 2018 at a ceremony in the European Parliament in July 2017. The European Entrepreneurial Region (EER) is an annual project that identifies and rewards three EU territories which show an outstanding and innovative entrepreneurial policy strategy, irrespective of their size, wealth and competences. The territories with the most credible, forward-thinking and promising plan are granted the label ‘European Entrepreneurial Region’ (EER) for a specific year. Only the regions with the most credible and promising entrepreneurial vision are awarded as the European Entrepreneurial Region (EER) by the European Committee of the Regions (CoR). This year Central Macedonia, Ile-de-France and Northern and Western Region of Ireland convinced the EER jury with their outstanding strategies and commitment to boost entrepreneurship within their territories. “The European Entrepreneurial Award is a true celebration of our regions as the bedrock of Europe’s economy. This year’s winners are an inspiration showing that our regions are taking the lead in supporting SMEs and entrepreneurs to create the jobs of tomorrow”, said Karl-Heinz Lambertz, President Elect of the European Committee of the Regions. The Northern and Western Region of Ireland outlines an ambitious and comprehensive strategy responding to the threat posed by Brexit to the territory, which constitutes 90% of Ireland’s 500km border with Northern Ireland. The action plan is based on the 10 principles of the EU Small Business Act identifying few remaining gaps and listing steps, targets and deliverables to be achieved during the EER year 2018. It includes innovative actions, such as capitalising on the National Ploughing Championship – Europe’s biggest agricultural exhibition – to promote entrepreneurship in rural areas, or targeting Irish emigrants through an awareness raising campaign implemented in the regional airport. The implementation of the prize-winning regional strategies will be monitored throughout 2018 by the EER jury, composed of Committee of the Regions members, representatives of EU institutions, social partners and territorial associations. After the completion of the award year, the jury visits the awarded territories in order to verify the progress made and provide them with an objective outside view on their policies. The main results and achievements of the EER 2018 winners will also be shared and discussed among regional and local authorities through the EER network. The NWRA host a tailored, accredited Post Graduate Diploma in EU Studies to support Local Authorities, Business Development Groups, and Education and Research Bodies to gain a better insight into European affairs and understand the various funding mechanisms available. The aim is to create a more effective network of skilled personnel in the regions adept at leading EU funding applications. The programme is aimed at senior management personnel and those challenged with EU project responsibilities. The accredited programme is delivered in association with the European Institute of Public Relations and the Leuven Institute in Brussels. Established at the end of 2016, 55 people have successfully completed the programme to date.